I like to spoil myself during breakfast. I know I've mentioned it before, but a hot breakfast is my favorite way to start the day. Each morning I wake up early enough to give myself time to relax and indulge in one of my favorite meals. The rush of the morning often dictates the pace of my day. Taking a moment away from the haste of throwing on clothes and the stress of doing something with the mop on my head allows me to get my mind in the right place and my head on straight. Literally. Breakfast is the soft yawn in an early morning. Though I do enjoy indulging in warm weekday breakfasts, weekends are where the true decadence takes place. I often make myself a pleasant brunch of pancakes and waffles for one (or two, if a friend is near). Some days there are a couple scrambled eggs or a slice or two of bacon, but carbs are often my go-to place for comfort. With the long, relaxing hours of a weekend morning, the recipe innovator in me comes out to play. Without the free time and a love for dessert, I'm not sure these cappuccino pancakes, dark chocolate oatmeal, and vanilla rum-soaked french toast would have ever found their way onto my plate. 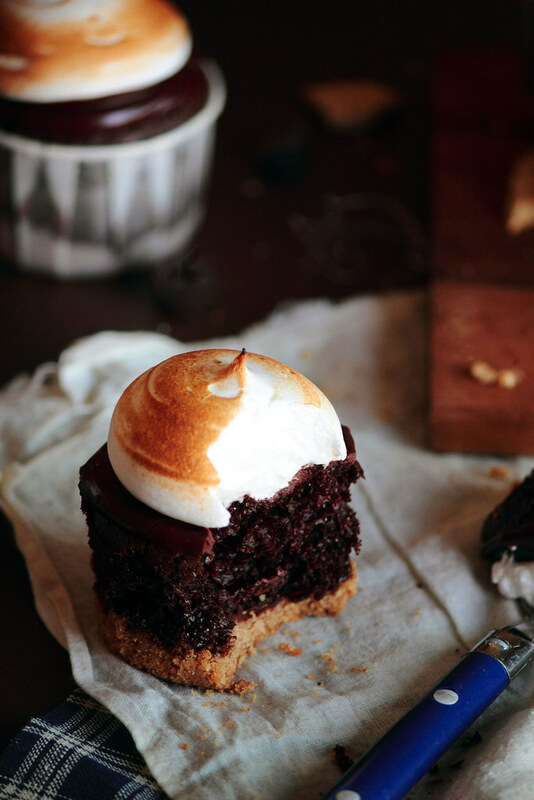 Perhaps one of the most quintessential summer desserts is the s'more—graham crackers, marshmallows, and chocolate. Since I've only been near a bonfire once or twice this summer, I haven't had my fill of summer s'mores just yet. 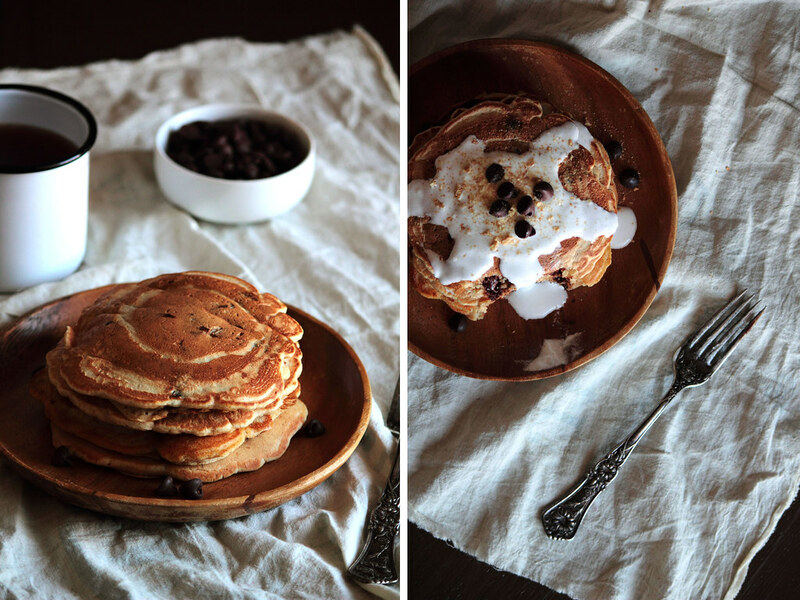 Turning s'mores into a pancake was surprisingly easy (with exceptionally delicious results). So often when taking a simple dessert (like s'mores) and using the flavors to transform another treat (pancakes), the flavor profile isn't quite the same or one flavor is more dominant than another. However, at first bite, I can say with great certainty that the profile of these pancakes fits the source almost exactly. And, oh, that is a very good thing. 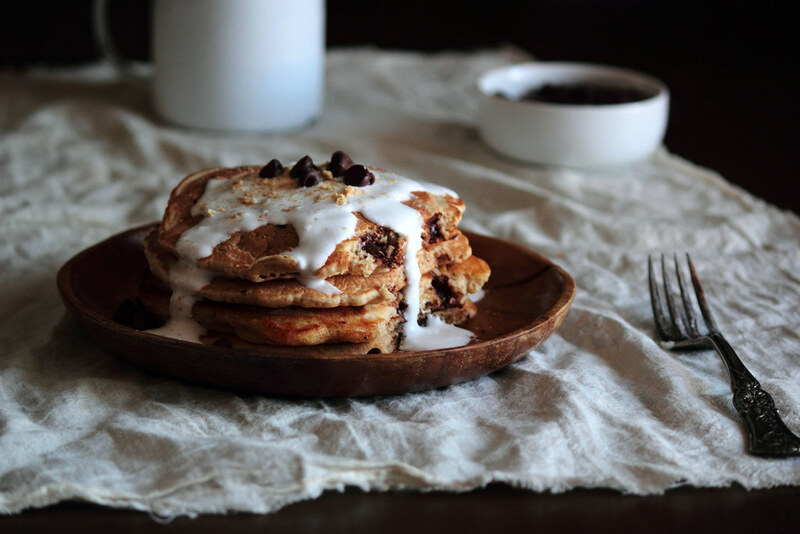 S'mores Pancakes turn a weekend morning into a special occasion. 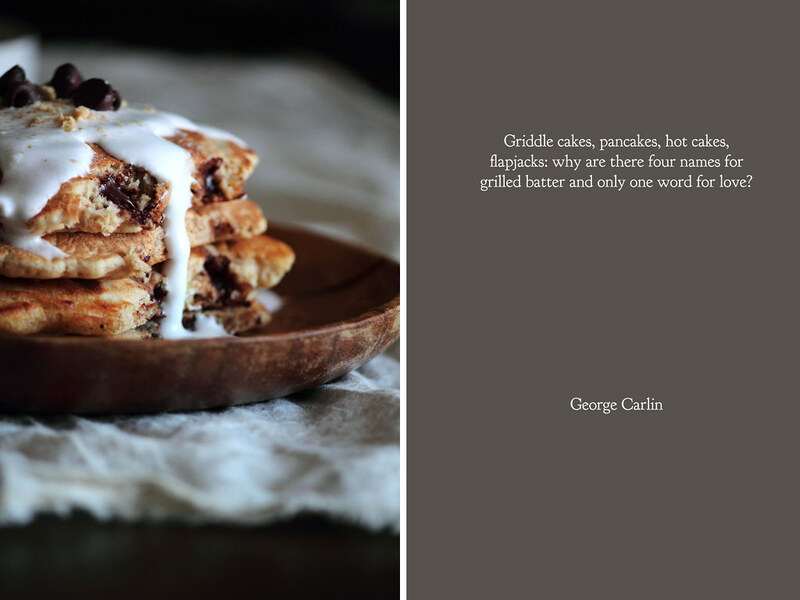 The pancakes are infused with graham cracker crumbs, which make the pancakes taste just as they should. 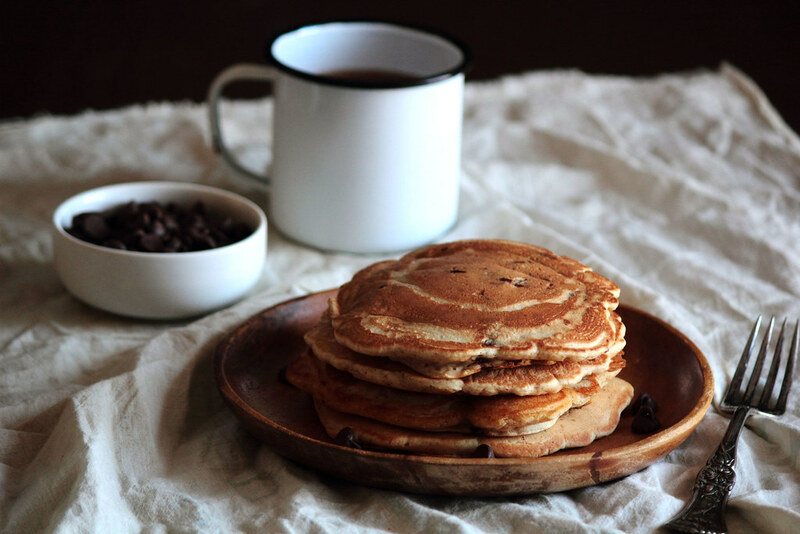 Add a few chocolate chips to the batter and the warm pancakes melt the chocolate in a dreamy way. Marshmallow fluff is turned into a syrup and drizzled over the top, turning a simple pancake into a beloved summer treat. In between my break away from physics and finding a job in an established bakery, I worked in a small cake shop selling special order cakes and thousands of cake and cookie decorating equipment. Though my job title was "baker," it was a far stretch from my actual job description. I spent one or two mornings a week baking up boxed cake mixes; my employer hovering over my shoulder convinced I was going to mess them up. It was frustrating in many aspects. Though my boss was truly a lovely woman who went out on a limb to give me a chance, the job wasn't quite what I had dreamed of. 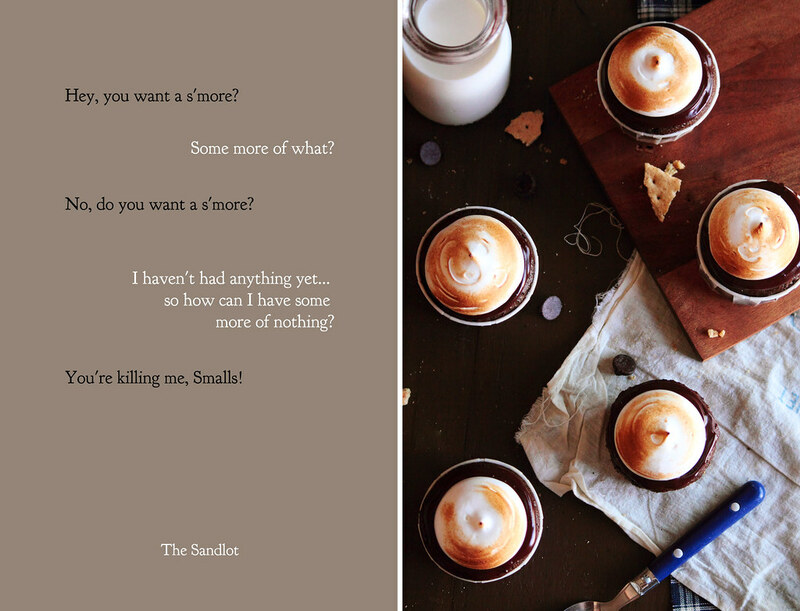 I spent my hours daydreaming of a bakery where I had freedom of ingredients and the trust to make something delicious (it would eventually happen, but not today). The cake shop didn't even have a stick of butter buried in the back of the fridge. I looked. When I wasn't in the back of the store baking, I was out front helping customers and keeping the shelves stocked. The store was never terribly busy. Most of my time was spent languidly lining the food colors in stick straight lines, the sound of my breathing and the shuffling of paper in the back the only noises in the stilled shop. Among the quiet activities, attending to The Wall of Sprinkles became the most time consuming. The wall held at least a hundred different packages of sprinkles of every imaginable shape and color—jimmies, nonpareils, dragees, sanding sugar, crystal sugar, holiday sprinkles, and so forth. It was, in essence, a sprinkle lover's mecca. Rather than "baker," my job title really should have read "sprinkle curator." I attentively filled the sprinkle containers by weight, tapped them shut tightly, and priced them with love. I arranged them by color, type, and holiday on the shelves—five containers in back and four in front. I never meant to get irrationally obsessed with The Wall of Sprinkles, but it was beyond my control. As soon as a customer bought one of the sprinkles off the shelf, I would run to the back to grab another to make my sprinkle-lined shelves even. Looking back, I think I was looking for validation. Validation in my decision to switch careers and validation to pursue baking. If I couldn't prove to my employer that I could bake, perhaps my devout attention to The Wall of Sprinkles would, in some small way, redeem me. It took a couple months of hard work before she allowed me to frost the cakes for her to decorate. It was the smallest of steps for me, but for her it was as large as the Grand Canyon. Though I set out to learn to bake, the true skill I came away with was patience. Honestly, I think it was more valuable in the end. Well, that and I have an unusual fondness for sprinkles. Note: I'll be vacationing in warm and tropical Hawaii this week so I'll be taking the week off from blogging to soak up the sun and get sand between my toes. Don't worry, I'll pack as many photographs and anecdotes as can fit in my suitcase on my return. Have a lovely week! I'll be certain to have a Mai Tai and think of you. 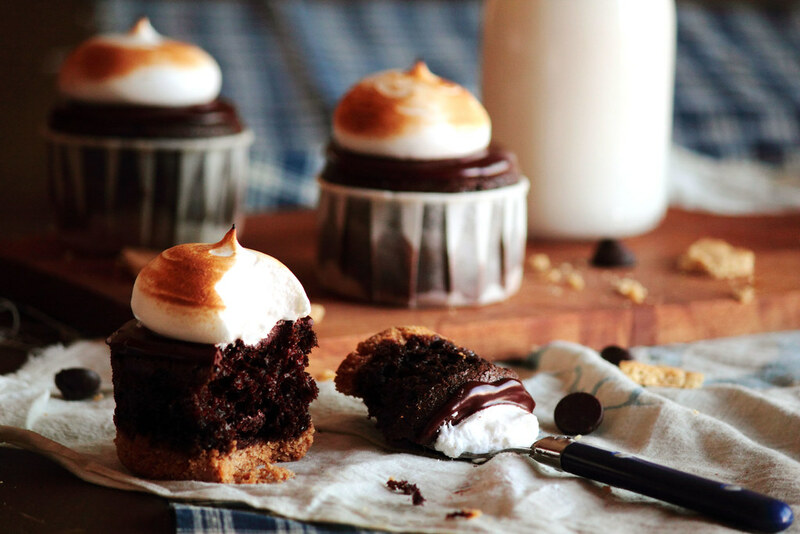 These S'more Cupcakes are delightful, irresistible, and impossible to ignore. 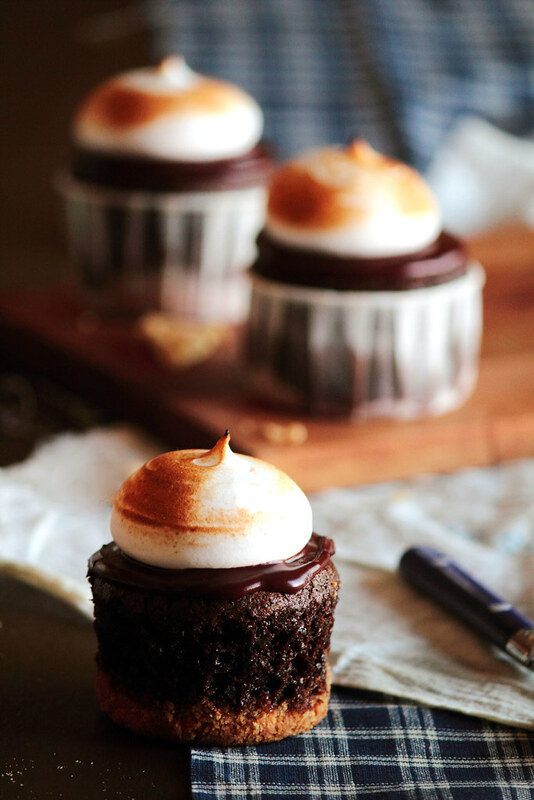 The cupcakes have a crunchy graham cracker base, topped with a sweet chocolate cupcake, rich chocolate glaze, and toasted marshmallow meringue. 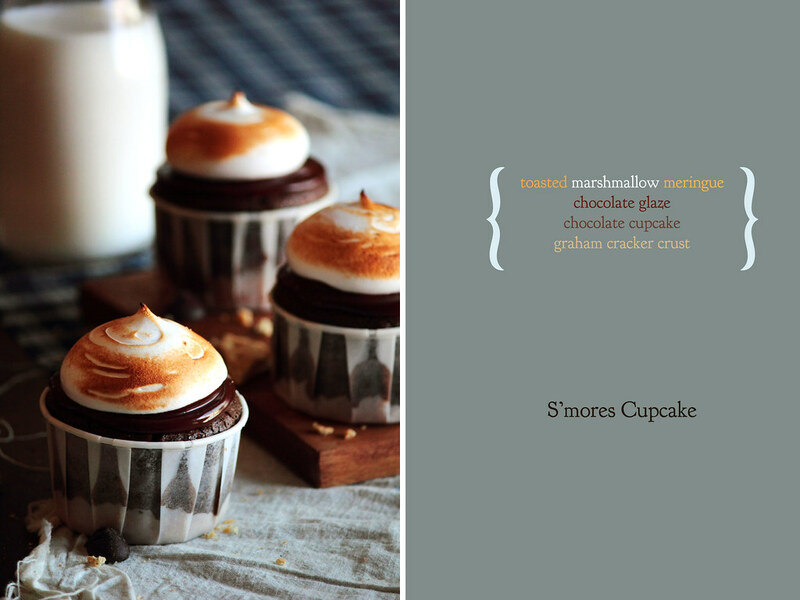 I love the texture of these cupcakes—crunchy, light, soft, sticky, and gooey. 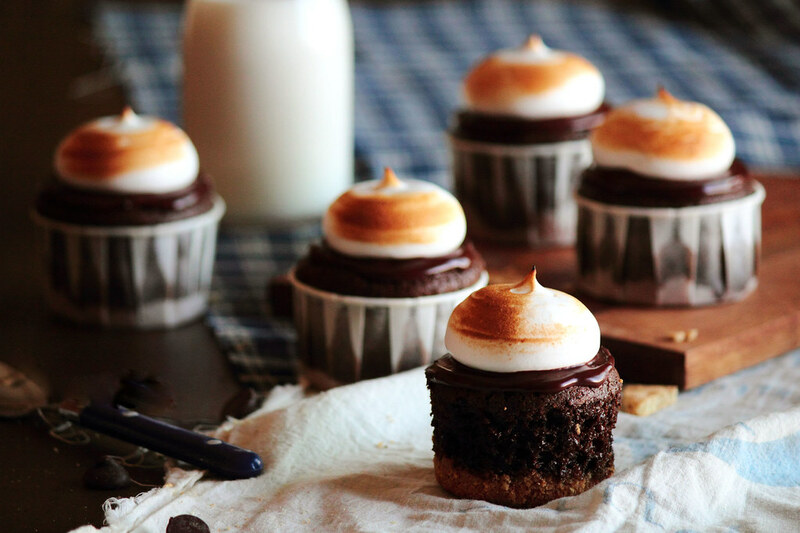 It truly is a s'more in cupcake form. These are perfect for birthday parties, long summer nights, and when you want a special treat just for you.